Banggood’s 12th anniversary is approaching. To mark this occasion, the company is gonna to hold a big celebration and unprecedented sale for you. It will begin as the warming up part on August, 20th, along with a variety of great coupons and discounts. And it will last until Sept, 10th. From Sept. 5th to Sept. 7th, it is the time when all the big discounts and coupons are shown to you so you should pay more attention to it. 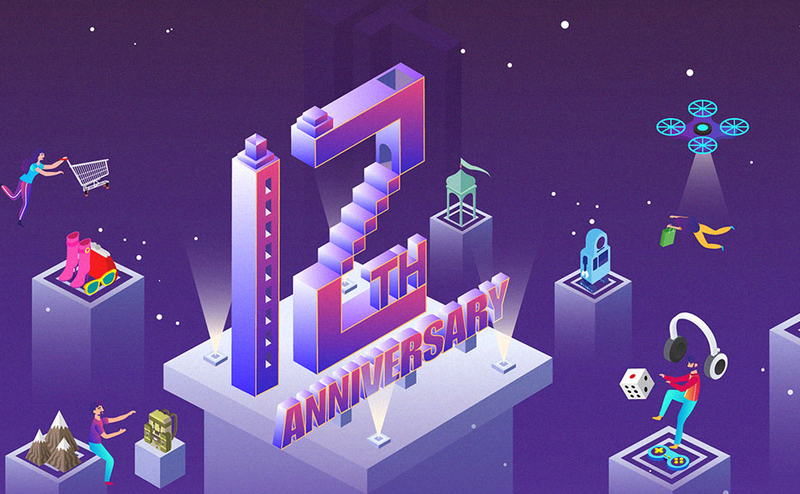 The Banggood ‘s 12th anniversary will be the biggest events for you this summer. However, how can we become the greatest winner in this sale events? Let me share the tips with you to help you hunter what you want at the lowest price. Firstly, 9%off coupons are what you should not miss. From August 22nd to Sept, 10th, 600 coupons will be available for you. But they will be released for you at three rounds. So, you should pay more attention to when it will start. Secondly, coupon rain is the great surprise for you. But it will be offered in the Banggood app. So if you do not have installed Banggood APP, quickly download it and you will gain more discount as a new user of APP. Thirdly, free orders may be the biggest news for you. From Sept.5th to Sept. 7th, 600 pc free orders will be provided for you. That is to say, you are also given the chance to buy what you want for free. In the RC Toy & Hobbies, you can get a big discount of 71%off. Someone who loves electronics may be amazed at the products that you want are at a price as lower as $1.36. Besides, in this part, you can also have the opportunity of buying one and getting one for free. In addition, Banggood never disappoints you when it comes to the promotion of smart device. The big discount of 69%off is offered in many smart devices that you may be interested in. Of course, the section that women expect most may be the home and fashion part. Here you can get the biggest discount of 91%off in this big promotion. Moreover, all kinds of items are reduced a lot in price. In the outdoor product category, most of the products are given to in a big discount. Amazingly, it also provides you with products at $0,99. The surprises offered in the Banggood’s 12th-anniversary celebration is limitless. If you want to know more about it, please log in to the Banggood web or download its app. Banggood is one of the most important e-commerce companies in China. Since its establishment, it has been providing the best products and the most professional service for people in the worldwide. So join us and become the part of Banggood’s brightening future.